Summer is here, and with the holiday season around the corner, there is even more reason to get behind the wheel and take in South Africa’s wonderful scenery. Hidden gems, rare finds, and unexpected discoveries are almost guaranteed, and spontaneity is encouraged. However, some upfront planning is necessary to make sure that your journey is as pleasant as eating an ice-cream on a hot summer's day. Our list of pre-departure and en-route tips will ensure that you make this road trip your best adventure yet! Go ahead, inspect that car. Car problems can quickly deflate the excitement of being on the open road, especially if they could have been avoided. Before hitting the road, be sure to give your car a complete inspection - check your tyres, oil, petrol and water levels, as well as your windscreen wipers and lights. Make sure you have all the necessary tyre changing equipment, just in case you happen to fall victim to a puncture. Being stuck on the side of the road for hours isn’t anybody’s idea of fun. Plan your pit stops. Whether you’re using a navigation app or a traditional map to get you to your destination, familiarising yourself with the route before you set off will allow you to plan rest breaks with a purpose. Whether it’s filling your bags with local produce at the nearest padstal, visiting the local farm or (most importantly!) refueling both your car’s tank and your empty tummies, look out for stops that break the monotony of being on a long, (more than likely) hot drive. Be prepared for the unexpected! Rest, relaxation and lots of fun is definitely the order of the day – but it is also important to be prepared. Save a few ‘ICE’ (in case of emergency) numbers on your phone so that your loved ones can be easily reached should you be involved in an accident. Another wise move would be to activate Emergency Alert on your MiWay car insurance policy. This device gives you the peace of mind that emergency services will be dispatched if you are involved in a serious accident and unable to phone for assistance. Keep the whole family happy! Driver distraction is one of the most common causes of accidents, so have a plan to keep passengers entertained. Classic car games like ‘I Spy’ can be effective in keeping fidgeting to a minimum, or there are plenty of great road trip apps you can try out that don’t require any driver input. And don’t forget the padkos - whether you plan to stop for food or eat it on the road, a full coolbox of snacks in the car keep everybody feeling happier! Get your groove on! What’s a roadtrip without a playlist? We won’t even bother answering that. 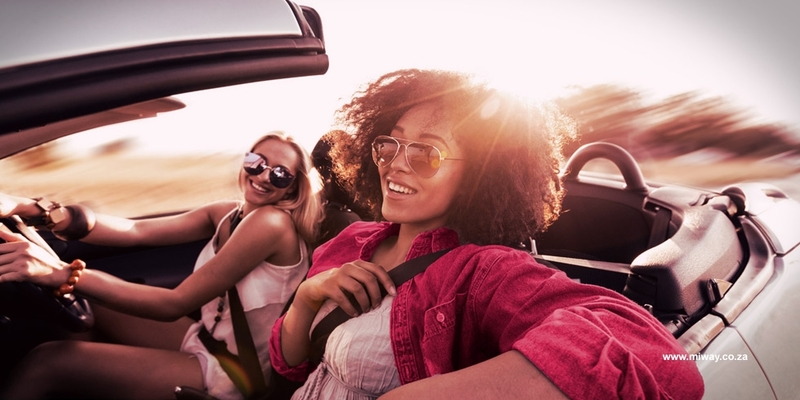 Choose an upbeat playlist with songs that the whole car can sing along to – and if your tastes differ, remember to give everybody a chance to choose a song. You could even turn it into a game, where people have to guess the title and artist – the person with the least amount of points by the time you reach the next rest-stop has to buy snacks for everyone else. Arrive alive. Sure, you may be in a hurry to kick off your shoes and bury your feet in the sand, but getting to your destination in one piece is more important than getting there on time! Should you, at any time, feel fatigue coming on, pull over and take a break. The holiday season means more cars on the road – which means an increased risk of accidents. Unfortunately, not all drivers will be as prepared for long-distance driving – which is where comprehensive car insurance comes in. So when life happens, just remember that your MiWay family has you covered with 24/7 roadside assistance – just another way we enable you to live your way and enjoy your trip.